Allianz Arena in the north of Munich, Germany. English : Allianz Arena in the north of Munich, Germany. Picture of a flower head of an Allium 'Lucy Ball'. Photo taken in the Pond Garden in Bed 1, 2 3, or 4 at the Chanticleer Garden (Philadelphia) where the species was identified. English : Picture of a flower head of an Allium 'Lucy Ball'. Photo taken in the Pond Garden in Bed 1, 2 3, or 4 at the Chanticleer Garden (Philadelphia) where the species was identified. English : Opera House of Paris, the Palais garnier's grand salon. A rock pigeon (Columba livia), taken in Santa Barbara, California, USA. English : A rock pigeon (Columba livia), taken in Santa Barbara, California, USA. Formica lugubris is a species of European red wood ant in the family Formicidae. English : Formica lugubris is a species of European red wood ant in the family Formicidae. English : Panorama of the mountains along the Ulvikfjord, a side arm of the Hardangerfjord in Western Norway. English : The Whirlpool Galaxy (Spiral Galaxy M51, NGC 5194) is a classic spiral galaxy located in the Canes Venatici constellation. Sea Otter (Enhydra lutris) preening itself in Morro Bay. English : Sea Otter (Enhydra lutris) preening itself in Morro Bay. The Ptolemaic geocentric model of the Universe according to the Portuguese cosmographer and cartographer Bartolomeu Velho (Bibliothèque Nationale de France, Paris). 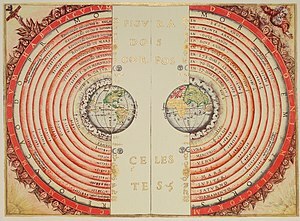 English : The Ptolemaic geocentric model of the Universe according to the Portuguese cosmographer and cartographer Bartolomeu Velho (Bibliothèque Nationale de France, Paris). A Yellow-eyed Penguin (Megadyptes antipodes) in the Curio Bay, New Zealand. English : A Yellow-eyed Penguin (Megadyptes antipodes) in the Curio Bay, New Zealand. Silesian Beskids, one of the Beskids mountain ranges in southern Silesian Voivodeship, Poland. English : Silesian Beskids, one of the Beskids mountain ranges in southern Silesian Voivodeship, Poland. The castle of Maintenon. Eure-et-Loir département, France. English : The castle of Maintenon. Eure-et-Loir département, France. English : A fire in Massueville, Quebec, Canada. Iceberg between Langø and Sanderson Hope, south of Upernavik, Greenland. English : Iceberg between Langø and Sanderson Hope, south of Upernavik, Greenland.